Discussion in 'Utah Jazz' started by candrew, Feb 12, 2019. I never liked Chris Paul, but I took the stat keeping comment as a joke. People on this board are nuts. Did you miss the part where he plays for Houston? Yeah, like he's in total awe. But that would be way more boring than discussing if Chrissy hates white ballers. And, as someone mentioned in the Twitter thread, Stockton's home vs road assist #'s are comparable - 10.9 vs 10.1. CP3 has played 5 more home games then road games. Stock finished his career with 2 more road games then home games. JazzAvenues and candrew like this. I think it came from straightlines mind. Probably because cp3 is in 8th place meaning 7 guys have more assists than him but he only questions the accuracy of the stats of one of those 7 guys and that guy happens to be white. He could have questioned the accuracy of statistics during that entire era rather the accuracy of the statistics for one individual player. Or he could have questioned the accuracy of the stats recorded for magic Johnson for example. I know that there is a perception that white guys are not as good at basketball as black guys (for good reason since it's true) and maybe it hurts a guys pride more to be beaten by a white guy. Stars Fan, NUMBERICA and str8line like this. To catch Stockton somebody needs to take care of their body like Stockton did and play as long as he did. One thing is average number of assists but the other thing is games played. None of these sissies now can stay on the floor long enough to catch John. Paul already missed 160 games ( X 9.7 ast. average would give him 1552 assists to move him into 3d place all time just behind J.Kidd) more than Stockton and for sure he is not playing until he is 40. So he needs to shut his stupid mouth, do some math and understand the real reasons why he will never catch up John. I agree. People see things in different ways though. I was just answering your question. People this upset over a joke? Thee jazz fan likes this. 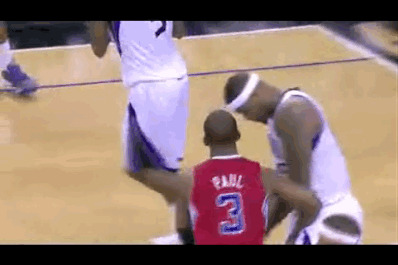 For as much as CP3 whines, it's hard to differentiate between him making a joke and taking a shot. I personally thought he took a subtle shot at the legitimacy of Stockton's accomplishments. If he would have said the exact same thing about Magic, I guarantee it would be a conversation somewhere. str8line and LoPo like this. I took it as a joke as well but did peak my interests to see what their apg splits were for home and away. I don’t think he’s serious but I’m all for ******** on cp. str8line, RJF, NAOS and 1 other person like this. To catch Stockton somebody needs to take care of their body like Stockton did and play as long as he did. .
No one will catch him. It's a different game now. Clearly a joke, nothing to see here. CP's missed more games just this season than Stockton missed in his 19 year career. JazzAvenues, Jazz Spazz, str8line and 2 others like this. Looks like Dirk or Vince might take over Stockton's #3 spot this season. tfivas and LogGrad98 like this. Jazzta and tfivas like this. Oops, not Vince. Just Dirk.